Here is another example of an improperly installed interpanel hinge. 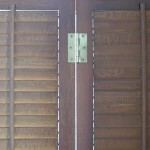 These appear to be fairly nice quality wood stained traditional shutters which have been ruined by poor installation. Notice also the light gap between the shutter panels. This indicates the shutter panels are not rabbeted. This entry was posted in Interior Shutters, Shutter Details and tagged install shutters, shutter hardware, shutter hinges, shutter installation, staned shutters, traditional shutters, window shutters, wood shutters. Bookmark the permalink.